It’s a new year and this time I decided not to make any new year’s resolutions. Instead, I’m going to make new year’s promises. While some might say this is simply a matter of semantics, it’s important to me to make the distinction. It’s easy for me to break a resolution, but a promise, well, that’s a big deal. 1. I promise to say yes to God’s prompting on my life. I’ll say yes to divine appointments even after a long day when I’m looking forward to flying home with hopes of no one sitting next to me. 2. I promise to say yes to my family every time I can. It’s easy to shut down my wife and sons with the simple, “no.” But I promise to yes every time I can and only to say no when there’s a better yes waiting for them. 3. I promise to say yes to my dreams. Life is fragile and we’re only guaranteed today, so I will say yes to the dreams God has planted in my heart and will give them the time and discipline in order for them to become realities. 4. I promise to say yes to my friends. The longer I live, the more important relationships become to me. People are not distractions or a means to an end. They are precious treasures whose stories are intersecting with mine and whose lives enrich my own. I will say yes to them every chance I get. 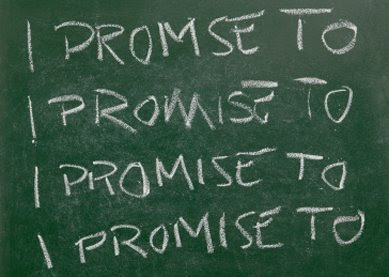 What about your promises? What’s the most significant one of the year? This year I promised myself to get past my divorce and rebuild my life again. Thanks for the post. I decided I need to be bolder in my faith and not be afraid to share it with those who need to hear it most. You have been a great example of someone who lives it out. Ok, I need to adopt these too. Maurilio, I clicked on the link you tweeted tonight to see what promises you were renewing. Then I scrolled down to comment and saw I was the last one to comment on this post back in 2009. I'm not even sure if my comment was about this particular post or not, because it seems out of context, but I was instantly taken back to where my life was at that exact moment, when I was at the beginning of my breaking. My life was in a very different place then and I had no clue that the following 2 years would look like they have. But tonight, I am reminded of God's faithfulness in my life, and I am grateful. I think you're right; your comment and my reply are out of context. It probably happened when I moved blog platforms. But regardless, I'm glad your journey of faith has brought this far. Thanks for sharing your story with those around you.